As I make the transition to focusing my research on mountaineering, there are two questions that I ask myself: first, "what do I already know about mountaineering?" and second, "what do I want to know about mountaineering?". 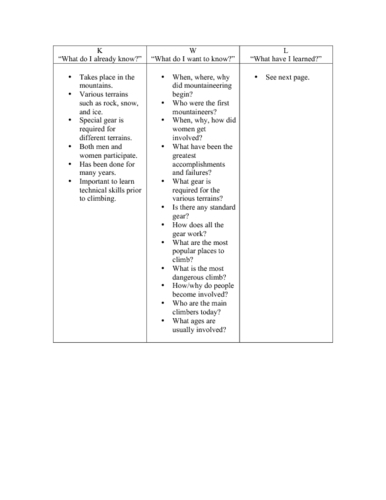 I will be using a KWL chart to better organize the answers to these questions. Before I begin my research, I will fill in the "K" column of the chart. In this column I will answer the question "what do I already know about mountaineering?". Then, once I review what I already know, I can begin to answer the second question, "what do I want to know about mountaineering?". Answers to this question will go in the "W" column. Once I begin to research mountaineering, through various texts and films, I will be able to answer a new question: "what have I learned about mountaineering?". Answers to this question will be recorded in the "L" column. Brown, R. (2002). Women on high: Pioneers of mountaineering. Boston, MA: Appalachian Mountain Club.